1. Do you regift...and if so, do you have a regifting horror story? Santa does a great job in our house! Big, All Out Meal... this year I'm cooking on Christmas Eve, but sometimes I do the big meal on Christmas Day... when I was in high school and college, my mom would do our big meal on Boxing Day (Dec 26th for my American friends) because she worked retail and closed the store late on Dec 24th, and she used Dec 25th to relax and get ready to cook the big meal. 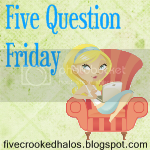 Please share your answers in the comments section below or make your own post and let me get to know you on 5 Question Friday!